March marks the annual #OneWeek100People sketching challenge! The challenge, started by Liz Steel and Citizen Sketcher (Marc Taro Holmes), invites sketchers worldwide to practice sketching people. I participated in 2017, and got to 47 people. Hmmmm. Not great. This year I was determined to complete the challenge. I knew I’d be traveling during most the week, so decided to make a system to easily track how many were completed. I started by making a 10×10 grid in my sketchbook, which gave me a tiny space for each person. Using a small pen, I observed and captured simple figures of the people. They are so little! Total time: 91 minutes, 4 locations in 2 days. Yay! It’s kind of nice to see them all on one page. 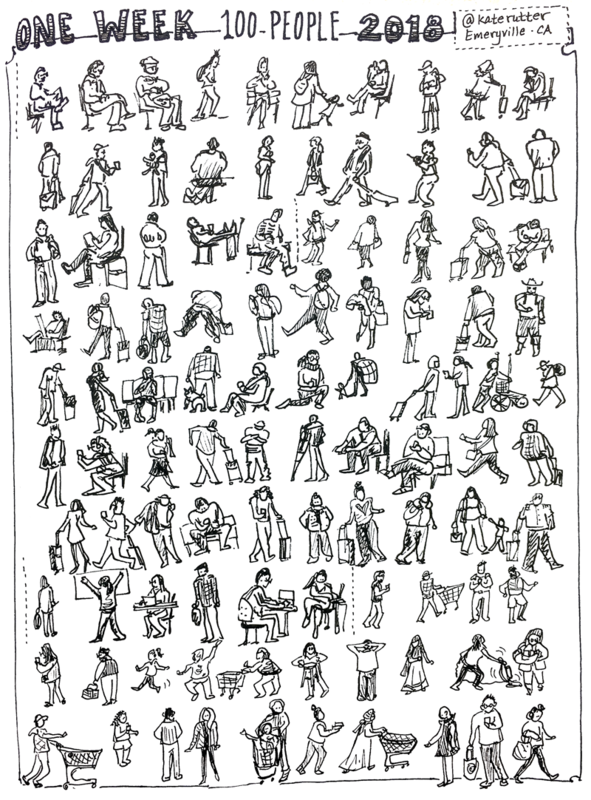 Completed page of 100 teenytiny people. The experience was a lot of fun, and I encourage you to try it! No need to wait until next year’s official challenge…you can do it any time.